Following months of repeated denials by former school board president Mark Sproat, multiple sources and documents indicate contact between Sproat and at least one Niles West administrator, a parent, and a student regarding former girls basketball coach Anthony Konsewicz. The controversy first came to a head on Tuesday, April 4 when several parents of girls basketball players, as well as one student, spoke during the audience-to-visitor portion of the board of education meeting regarding Sproat’s alleged harassment of Konsewicz, which led to his resignation as coach. At the Tuesday, May 2 board of education meeting, the board reorganized; David Ko became the new school board president, ending Sproat’s two-year tenure. Sproat will continue as a school board member until Spring 2019, when his current term is up for reelection. Also at the meeting, school board members voted to launch an investigation into the allegations against Sproat. The school board hired Robert Swain of Arlington Heights law firm Hodges, Loizzi, Eisenhammer, Rodick, and Kohn LLP as the special investigator. The NWN contacted Sproat on Monday, May 8 with a request for an interview for further comment on the situation; Sproat did not respond. 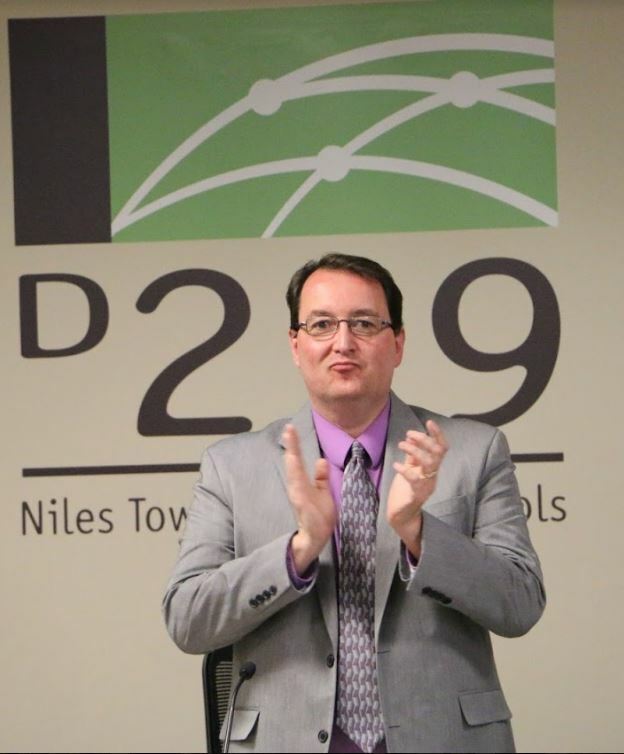 However, in previous interviews, Sproat has adamantly denied having any contact with Konsewicz, district 219 administrators, or students as was alleged. “I have had zero phone calls, emails, texts, nothing,” Sproat said following the May 2 board of education meeting, other than a meeting that allegedly took place in Nov. 2015 between athletic director Kendall Griffin, Konsewicz, assistant athletic director Terri Laux, June Sproat, Mark Sproat, and their daughter, during which June Sproat asked her husband to leave. Konsewicz paints a different picture. According to him, Sproat had a conversation with Griffin after the first basketball game of the year, Monday, Nov. 16, 2015 at York High School, as he was unhappy with his daughter’s playing time and role on the basketball team, as well as to express his discontent with Konsewicz’s role as a coach. Griffin confirmed that this conversation took place, and said he believed Sproat’s “heads-will-roll” comment was not only a threat to Konsewicz, but Griffin’s own position as athletic director. “After hearing that comment, I felt very uncomfortable by the tone and what I believed to be the overall meaning of that statement. I felt, as the athletic director, [that] the comment as a whole and the conversation as a whole made me feel very uncomfortable,” Griffin said. Yet according to Konsewicz, Sproat did discuss his dissatisfaction with Konsewicz’s performance as the head girls basketball coach with at least one student in the summer of 2016. “The [2015-2016] season finished, and the start of summer league is when this all started back up again. It came to my attention from a player that I was going to be replaced, that they would have a new coach at the start of the season. [One of the girls basketball players] was told [by Sproat] she would have a new coach before the season would start [in November 2016],” Konsewicz said. This student provided Konsewicz with a written statement detailing her encounter with Sproat. Niles West News obtained the written statement from the student on the condition of anonymity. “[Sproat] then asked me for my personal opinion on Coach K, but I personally enjoy having him as a coach. He disagreed and began to cuss words in his name. He said that he would start to call different coaches from all around to take the position as head coach as soon as possible. I asked him when this would take place, and he responded with by this upcoming winter season. Overall, he showed a clear, almost hatred towards Coach K. A description used to describe him was along the lines of a bad coach who doesn’t listen to his players or give opportunities to all of them,” the statement reads. Konsewicz also alleged that Sproat spoke to other girls parents about his intent to remove Konsewicz as head coach, an allegation that Sproat denied. “In the Christmas tournament, that we played out in Mundelein, [Sproat] told one of my parents that he wasn’t happy with his daughter’s playing time, and that I would be replaced; I have a written statement from the parent. He told the same parent on three separate occasions,” Konsewicz said. Scott Kipp, whose daughter plays girls basketball, confirmed this encounter. Information obtained through Illinois Freedom of Information Act reveals that emails exist between Sproat and Griffin. On May 5, 2017, NWN sent a request for records under FOIA, 5 ILCS 140. The request was for emails between public official Mark Sproat and superintendent Steve Isoye (date range of August 1, 2016 to April 26, 2017), former interim superintendents Mark Friedman and Steve Griesbach (date range of January 1, 2016 to July 31, 2016), and Kendall Griffin (date range of November 1, 2015 to April 25, 2017) using key words “girls basketball,” “girls softball,” “Tony Konsewicz,” “Nicole Reynolds,” “playing time,” “JV,” “varsity,” and “daughter.” All requests came back unresponsive except the emails between Sproat and Griffin. “The responsive documents contain communications between a public body and attorney and/or auditor representing the public body that would not be subject to discovery in litigation, which are exempt from disclosure under Section 7(1)(m) of the FOIA. 5 ILCS 140/7(1)(m). The responsive documents also contain predecisional information exempt from disclosure under Section 7(1)(f) of the FOIA, because it includes drafts, notes, recommendations, memoranda and/or other records in which opinions are expressed, or policies or actions are formulated, and which have not been publicly cited or identified by the head of the public body. 5 ILCS 140/7(1)(f). Finally, the responsive documents contain information that can personally identify a student as such is exempt under Section 7.5(r) of the FOIA. 5 ILCS 140/7.5(r),” the letter reads. This morning, Wednesday, May 17, NWN Editor-in-Chief George Panoutsos filed an additional FOIA request to produce, at a minimum, the date, time, sender, and recipient of the redacted emails. Allegations of bullying by Sproat went beyond just Konsewicz. Head girls softball coach Nicole Reynolds also alleges that Sproat attempted to use his influence as school board president against her. After hearing that Sproat’s daughter was choosing not to return to the girls softball team in order to play a different sport in the same season, Reynolds expressed her contentment that Sproat’s daughter would at least still be an athlete. During a phone interview on Monday, April 17, Sproat reiterated that he believes he is a parent first, and a school board member second. According to Konsewicz, he and Sproat, who were classmates at Niles West, had enjoyed a friendly relationship before the situation with Sproat’s daughter escalated. At the beginning of the 2015-2016 girls basketball season, Konsewicz allegedly requested new basketballs and an iPad for coaching purposes in response to Sproat’s inquiry about the team’s needs. Sproat was elected school board president in Spring 2015. “[Sproat] said, ‘What do you need?’ So I told Mark, ‘I could use some basketballs.’ He goes, ‘We will tell [former athletic secretary] Melana [Duric] to get those basketballs ordered.’ So low and behold, we only had $200 left in the [girls basketball] budget (basketballs are about $50 each), and I got a dozen of them. So we had friendly conversations,” Konsewicz said, noting that he did not receive the iPad he requested. The board of education packet for Dec. 1, 2015 indicates on page 23 that the following purchase was made on Nov. 24, 2015: women’s basketballs for a total of $588 and $20 for shipping from Santos Sports Store. According to assistant athletic director Terri Laux, the normal protocol concerning coaches’ requests for supplies begins in the spring of the previous year. Coaches needing additional equipment submit requests through the athletic director which then goes to the building principal, district administration, and, ultimately, the board of education for approval. Reflecting on the implications of the controversy, Griffin spoke to the moral obligations education workers hold to their students and, by extension, themselves. Divitya Vakil contributed to this article. Great BIASED reporting. A parent said it so it must be true! A student said it so it must be true! Does a board member have the power to fire a coach? Sounds to me like parents acting like high school kids spreading gossip. Parent complaints were all hearsay. Everything in the “STUDENT, PARENT CONFIRM CONTACT WITH BOARD PRESIDENT” section is based on hearsay. Every parent that spoke up at the board meeting alleging Mark Sproat’s actions against coaches/administrators were based on rumors, specifically stating “I heard that…” This isn’t being said as a family member to Mark Sproat, but as a journalist who is disapointed with the way this is being covered. Please go back and rewatch board meetings to make note of times that people say “I heard” or “There’s a rumor that.” Right now there’s a rumor going around that Mark was in the dugout of the varsity boys baseball team that his sons play on. Guess what? He doesn’t have any sons nor has he been to a baseball game at West. I just think you should print FACTS. You do notice that there are direct quotes from a teacher and an administrator who said this happened right? There is even a direct quote from a parent in this section. Stop attacking the NWN and their hardworking students/staff. They wrote a great story that’s backed by clear evidence. Even if you want to continue to defend your claim, two Niles West employees confirmed that this is what happened. If you really are a journalist, I think you should accept the REAL facts for what they are, and not create alternative facts. Coach K is a wonderful, kind, and caring teacher. It was an honor to be his student when I was 6 and again when I was 17. He deserved better. For example, Coach K said “I have a written statement from the parent. He told the same parent on three separate occasions.” That’s hearsay. The statement was written from a parent, but that’s one parent’s opinion based on hearsay. There is no fact. Also, as a real journalist, I have looked back at board meetings, interactions between my dad and others, and every claim here is based on hearsay. Sorry! The basketball team got basketballs – shocking. Your requests show that Sproat did not contact the coach. So how exactly is there harassment? ?